Future Proof Docs - The Productive Physician — Future Proof M.D. Welcome to another installment in the Future Proof Docs series. As a reminder, this is a series of posts highlighting physicians who excel at something outside of medicine and care enough to share their passions with us. Today I want to introduce the Productive Physician. Mark is a physician, medical educator, and a master at getting things done. I hope you will enjoy this Q&A. 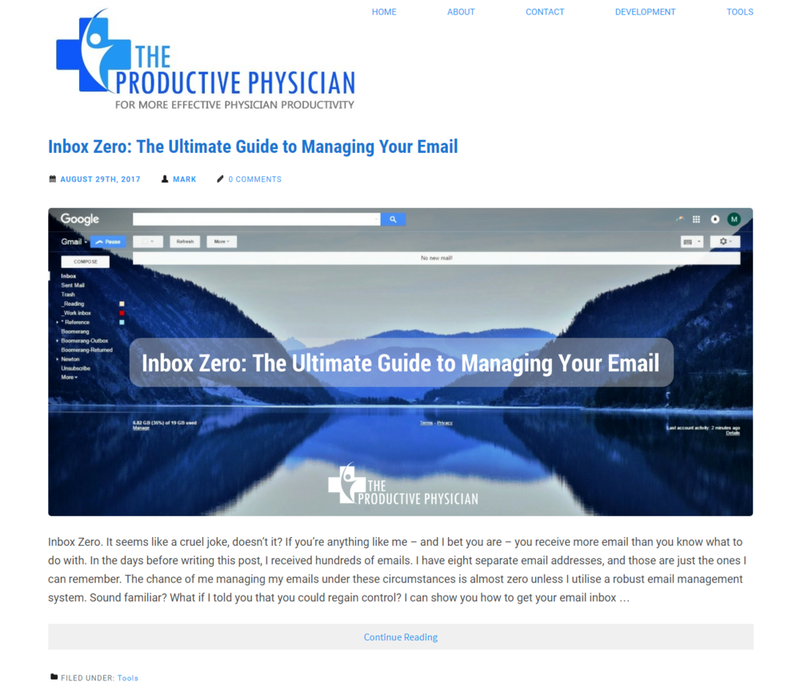 Mark is a Respiratory & Sleep Medicine Physician and the author at the Productive Physician (https://productivephysician.com). In addition to being a physician, he is an educator of medical students and trainees. He trained, practices and lives in Australia. When and why did you decide to become a physician? My first schoolteacher recalls me telling her I was going to be a doctor at the age of five, although I obviously didn’t know then what I know now! I should probably have said "astronaut" (but there is no space program in Australia) or "chef". I tried most of the medical specialties before deciding on Respiratory & Sleep Medicine, partially because I derived little enjoyment from the others and partially because I found a mentor in this field. The power of a mentor in the decision about further training cannot be underestimated! More recently, I have moved into clinical education as a side job and find that I derive so much satisfaction and energy from working with juniors and students that I can’t imagine giving it up. August 2016. I have previously administered and written for a film criticism website and blog, but only recently started blogging in the medical sphere. I focus on productivity for physicians but in the ‘personal productivity’ sense rather than the metrics that are used in the US to measure physician productivity (RVUs??). I suspect that defining your own metrics for success is more valuable in the longer term anyway. I started The Productive Physician as I had been consuming personal productivity materials (blogs, books, podcasts etc.) so much that I wanted an outlet where I could reflect on my learning and potentially help my peers while doing so. I suspect that most of us docs don’t have the time to invest in widespread reading around personal organisation and productivity and, therefore, hope I am performing a useful service. Much of the productivity literature is written for entrepreneurs or business people, and so I thought that translating the advice for doctors also would be of value. I have written more about my rationale at Why Productivity for Physicians? What is the biggest challenge running your blog while being a doc at the same time? How do you deal with it? My biggest challenge is finding time to write and edit. I look forward to the day when I have a posse of content creators all filling the site with great advice and it isn’t only me! I hope that I will continue to find my path to more effective personal productivity and that I can describe my findings in a way that is useful to other doctors. One strategy I am trying to stick to is rising early in the morning. I have never been a morning person but am trying to get up at 0500 regularly and find that I have added hours to my productive time each day! Forming a new habit after decades is easier said than done. What are the top 3 life lessons you have for FPMD readers? Measurement is critical to any process of improvement. This is something that engineers understand but wasn’t immediately obvious to me until I started measuring my performance in ways meaningful to me. “What gets measured gets managed”. Start early. The results of our efforts should increase as we develop, but if you wait too late to start, it’s harder to catch up (much like compound interest). This applies to making new connections in your field, performing research and academic publication, as well as personal things like leadership development. Invest in ongoing learning, but start as early as possible. Put yourself out there. I have lost track of the number of opportunities that I have received as a result of making contact with someone new at a conference or simply asking questions. Give me 3 blog/podcast/vlog posts that FPMD readers can visit to get the “core” of what you stand for. Chad Chubb, CFP ® founded WealthKeel LLC to help physicians navigate the complexities of financial planning. Today, we utilize true financial planning and custom-craft plans for residents and young doctors in the Philadelphia area and across the United States. From investments to insurance and student loans to goal planning, we tailor a plan to address your specific needs and circumstances. We will be by your side, today, tomorrow, and for decades to come to help you plan and build for all of life’s course corrections. Schedule your free introductory call online and see if we are a good fit for you. Dr. Bo Liu is an aspiring radiologist-in-training and the founder and editor of the White Coat Money Blog. He has an interest in interventional radiology and helping his medical colleagues get ahead in this mad world of medicine and money. When he's not crushing the list at the PACS station or typing up your next favorite blog post, you can usually find him at the local badminton club, movie theater or the most recently opened restaurant.